Give your infield skin the finished look of a professional's with Beacon's Cocoa Mat Drags. These virtually float across infield surfaces without displacing the soil or topdressing materials while providing a highly professional finish. They are also valuable for dragging topdressing turf. Available in hand drag size and tow-behind size, with or without leveling bar. Tournament-Ready® Soil Surfactant wetting agent is now available from Underhill International for use on sports fields and parks. Tournament-Ready provides both preventive and curative treatment of localized dry spots caused by "hydrophobic" soils, which repel water. With Tournament-Ready, water moves laterally and vertically into the soil profile for up to 14 weeks after treatment and improves the infiltration rate for better irrigation coverage. It is available in 2.5-gallon containers, 30-gallon drums and 24 6-ounce pellets. The TurfEx 1.4 cubic-yard capacity MS4500 topdresser features polyethylene construction, fully electric operation and precision spreading. 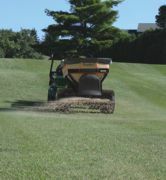 It has the ability to spread standard topdressing sand for golf courses, crumb rubber for synthetic turf fields and a variety of other bulk materials, including compost and soil conditioners. The MS4500's heavy-duty polyethylene construction eliminates corrosion and maintenance concerns associated with similar steel built models, while also making the unit up to 40 percent lighter. 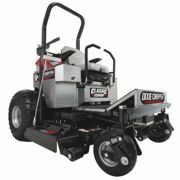 Jacobsen® has acquired the assets of Dixie Chopper®, a manufacturer of zero-turn-radius mowers. Known as "the World's Fastest Lawn Mower®," Dixie Chopper mowers are capable of mowing up to 6.6 acres per hour. The company manufactures 11 models of zero-turn mowers, from the residential Zee 2™ to the industrial category XCaliber™ Twin with two 27 HP Generac® engines and 74-inch deck. With the addition of Dixie Chopper, Jacobsen offers a complete line of turf maintenance equipment. Pro League Champion Brown is the newest infield conditioner from Turface Athletics, featuring a rich brown color. Like all Turface Pro League products, Champion Brown features smaller, uniform particles designed to ensure the ultimate fielding and sliding surface to keep skinned infields safe and playable. Improved manufacturing and dye processes provide even longer lasting color on the field to combine the aesthetic benefit of the Pro League product with superior moisture management. The AFD Mound Gauge allows a mound to be built from scratch as well as to check for proper slope. The gauge is made of 1 ˝-inch metal square tubing with calibrated drop-down bars every 1 foot to indicate the proper slope for a regulation pitchers mound. The pivot point is 18 inches in front of the rubber and 1 inch below grade of the rubber. The front portion of the gauge can be set by a skid or a wheel. The Line-Up Hash-Mark Painting System helps ground crews paint football field hash marks accurately and efficiently. Line-Up's individual hash mark and inbound line pans minimize paint overspray. Its built-in centering and offsets ensure the system produces consistent hash marks. Inbound lines and hash marks for an entire field are often painted in less than 90 minutes. Line-Up folds in half easily and weighs 48 pounds. Markers Inc. introduces Yellow Alert Temporary Fencing, with built-in Bright Yellow Bands to define outfield or sideline boundaries. The unique feature implies "caution" and provides an added margin of safety to players, spectators or others. Yellow Alert Fencing is offered in 160-foot rolls in Green, Blue or Red. This heavy-duty polypropylene fencing material provides exceptional strength for use inside or outdoors. Installation and teardown of the system, with no tools, is accomplished with the included SmartPole™ components.